Poor Bruce Bogtrotter, the schoolboy in Roald Dahl's book Matilda who was forced by the evil headmistress to eat a ginormous chocolate cake after getting caught stealing just a sliver. As his classmates cheered him on, Bruce finally finished -- but it was so painful, you just know that he would never eat chocolate cake for the rest of his life. 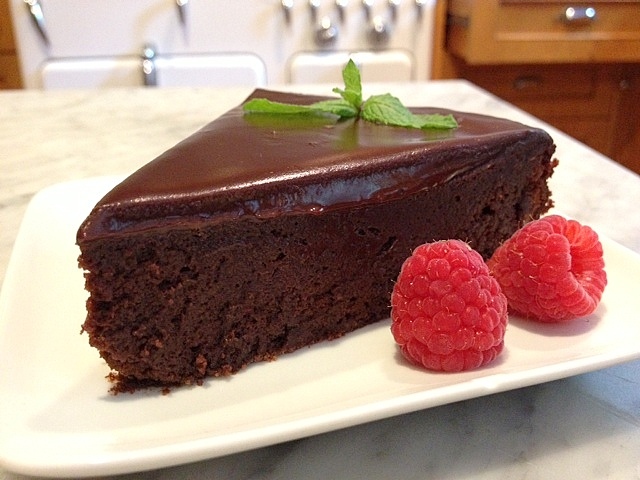 This dense nearly flourless chocolate cake is easy to make, slices beautifully and would make Ms. Trunchbull (the headmistress) proud. 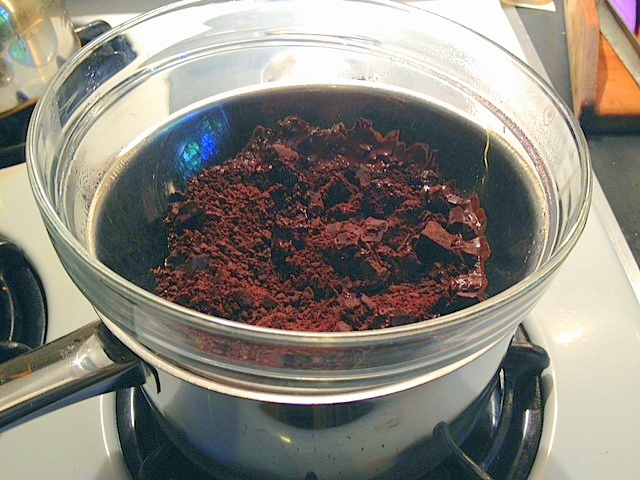 Start by melting the chocolate in a bowl set over simmering water. Add the butter and blend until smooth. After the rest of the ingredients are added (eggs, sugar and flour) pour into a prepared nine-inch pan. It should look like this when it's done. After a few minutes, it will "fall" a bit. But don't worry, it's supposed to. Just be sure to flip it over before frosting. 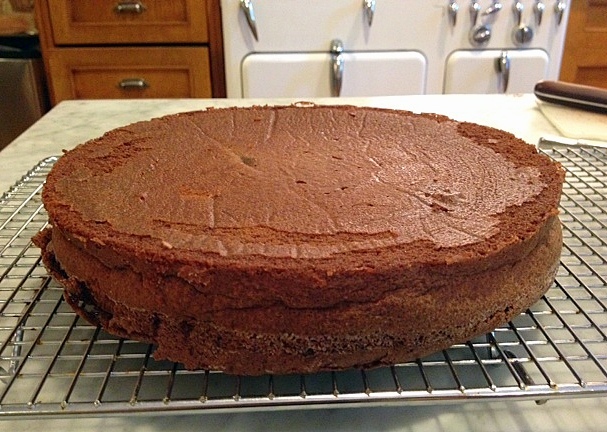 While the cake is cooling, begin making the frosting by melting chocolate and heavy cream. When it's well combined, remove from the heat and let cool slightly. 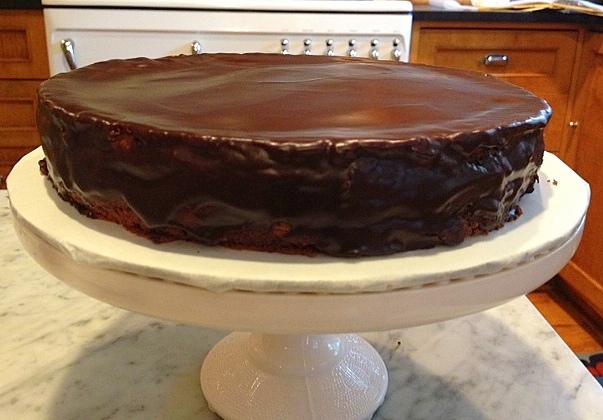 Place some parchment (or newspaper) beneath the cake to catch the excess chocolate frosting. It's best applied by spooning it on, and smoothing it out, if necessary, with an offset spatula. Below is a scan of the page in Revolting Recipes, illustrated by Quentin Blake. This recipe, and the others, were developed by Josie Fison, the Dahl family's private chef. 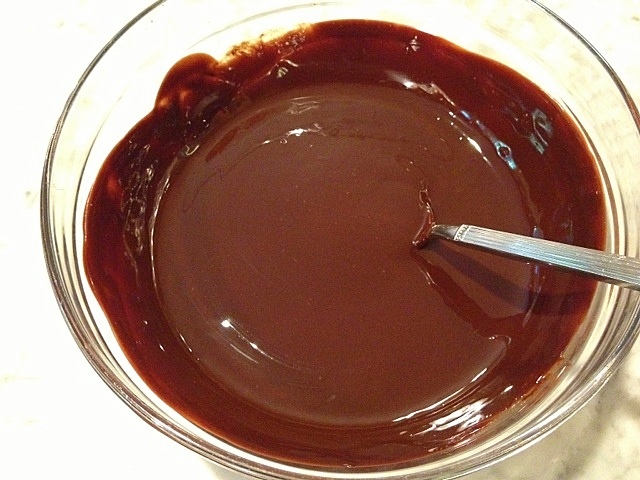 Melt the chocolate in a bowl set atop a saucepan of simmering water. Mix in butter and stir until melted. Transfer to a large bowl and add the sugar, flour and lightly beaten egg yolks. In a separate bowl, beat the egg whites until stiff. 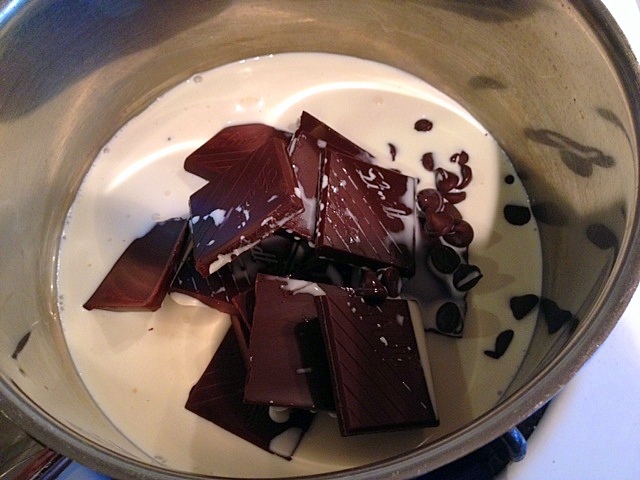 Gently fold half of the whites into the chocolate mixture, blending thoroughly, then fold in remaining whites. 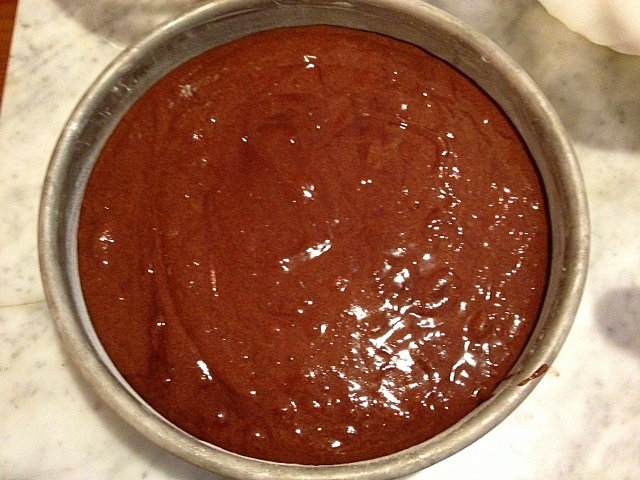 Pour the batter into the cake pan and bake for about 35 minutes. There will be a thin crust on top of the cake, and if tested with a toothpick the inside will appear undercooked. 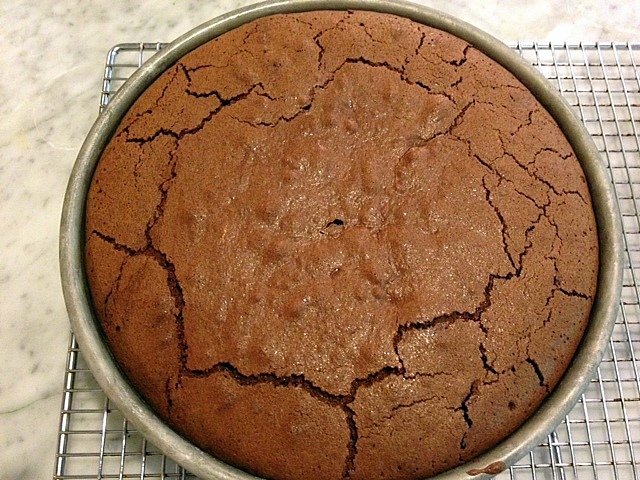 Don't worry; the cake will get firmer as it cools. Remove from oven and let cool in the pan on a wire rack. While the cake is cooling, make the frosting. Melt the chocolate with the cream in a heavy-bottomed saucepan over lowest heat, stirring occasionally until the chocolate is fully melted and blended with the cream. Remove from heat and cool slightly. 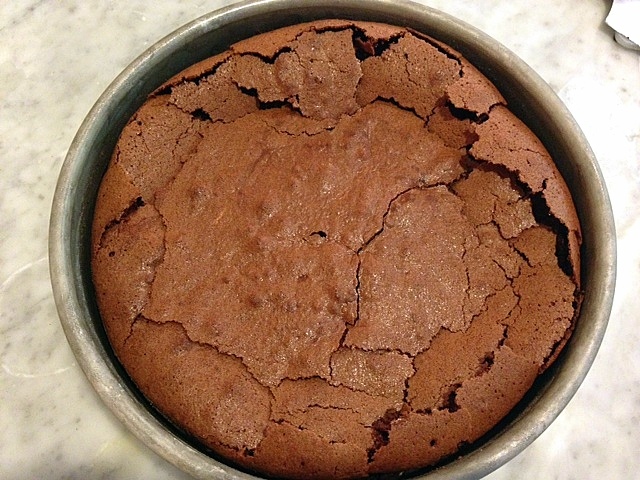 When the cake is cool enough to handle, remove it from the pan. Flip the cake upside down before frosting. 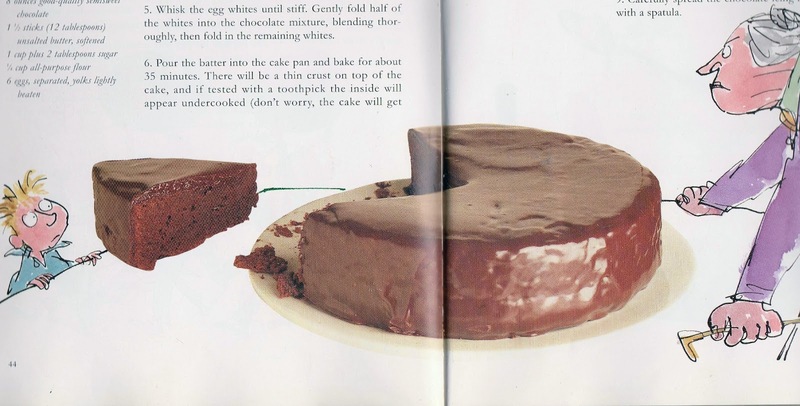 Carefully pour the frosting, with a spoon, over the cake. Smooth out with a spatula. Drooling and wishing that cake was here right now! Love visiting your site, always something good waiting. Thanks. I'm dying to see the Matilda musical; it was always my favorite Dahl story. This cake looks delicious too. I always thought the Revolting Recipes book was full of wacky things for kids, but clearly there are some gems in it. I'm going to have to hunt down a copy. If you can track down a copy of "Memories WIth Food at Gipsy House" it's lovely.